Carlton defeated Richmond by 5 points at Punt Road Oval. Goalkickers: H.Haughton 2, V.Valentine 2, D.Crone 1, V.Gardiner 1, J.Shortill 1. Carlton registered their 5th win from 10 rounds (plus a draw) over bottom team Richmond to move into second spot on the ladder. "Aided by the wind, Richmond players were soon busy in attacks upon Carlton's goal. A nice appreciation of direction and distance enabled the forwards to score three sixers, Rudd, Taylor, and Maybury taking the credit for these productive kicks. The opening quarter was a time of considerable trial for the Carltonians, but they twice managed to beat up against the breeze, only to notch minor points. In the third bout Richmond held back all dangerous opposition, and resumed scoring through the instrumentality of Fehring. Some chances were squandered, but presently Alessio gathered a nice goal, but the Carlton tally could not be overtaken. When, therefore, the final run was commenced with the Blues having both the score and the wind in their favor, it seemed as if Richmond's chance was quite gone. The men in Black and Gold were still out for success, however, and put in many great rushes, to the very active employment of the Carlton defenders. When Shortell, in trying to drive his side to a safe lead, hit the post, there was rejoicing in Richmond circles. This cooled off as Valentine urged the ball between the posts, but interest was re-awakened by a goal credited to Taylor, of Richmond. 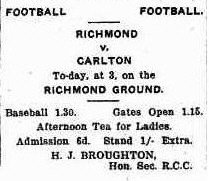 Another sixer would have brought victory to Punt road, but it was not forthcoming, and play ceased with general honors easy, although the scoring favored Carlton by 51 to 46. In the winning colors, Shortell, Haughton, Dunn, McGregor, O'Brien, and Carter were great performers." At the end of this round Carlton were in 2nd spot on the ladder with a percentage of 105.2. Ern Carter received the news at half time that his brother had been killed in action. Contributors to this page: blueycarlton , Bombasheldon , pblue , camelboy , molsey , WillowBlue , true_blue24 and admin . Page last modified on Friday 19 of September, 2014 08:32:06 AEST by blueycarlton. 1979 - Bluebird and Truth Cazaly Award. 1989 - Carlton Team List (27/03/89).